Fine Design Chooses 4Wall Las Vegas to Light CES 2017 | Press Center | 4Wall Entertainment, Inc.
Las Vegas, NV- International design firm Fine Design Associates returned to Las Vegas for the 50th anniversary of the Consumer Electronics Show (CES). 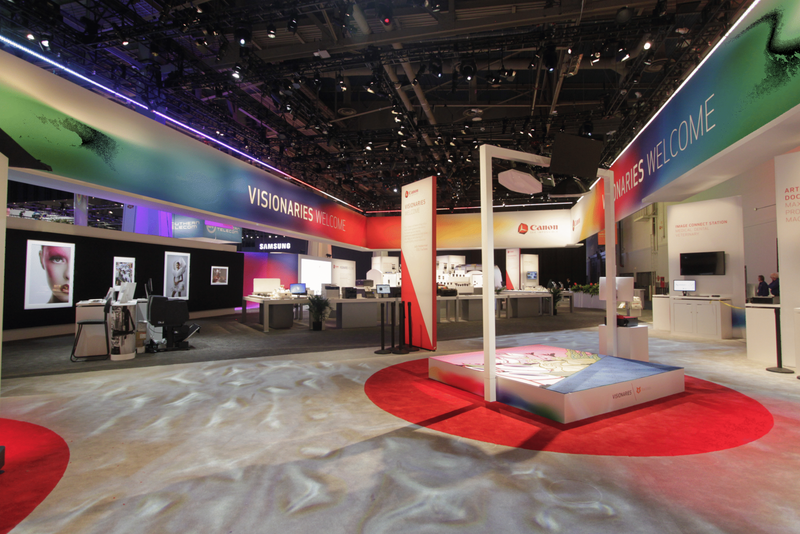 Fine Design turned to 4Wall Las Vegas for the gear needed to light the booths for major brands including Bosch, Canon, Panasonic and Samsung. Founder of Fine Design Associates, Paul Fine, has been fortunate enough to work with most of the major brands at CES since the late 90s. Fine has witnessed the booths at Las Vegas' largest trade show dramatically evolve during that period of time. "The booths now are more finessed, more integrated in terms of the approach we take when lighting them," explained Fine. "There is more LED product to install and control along with great, sweeping walls of fabric." The Fine Design team begins planning for CES as early as possible. "This is such a tactical show in terms of production but always cutting edge on design," said Fine. "We start with the client's concept in mind and work from there." Fine has turned to 4Wall Las Vegas for countless years to ensure his clients goals are met in regards to the lighting design. "We have to create booths that are impactful and provide a great atmosphere for attendees while putting forth strong brand awareness," explained Fine. 4Wall provided Fine Design with well over 1,300 light fixtures for the various looks needed at CES 2017. Moving lights included a wide range of Martin fixtures like the MAC Aura XB, MAC Quantum Wash, MAC Viper Performance and Viper Profiles. For LEDS, Fine's team utilized Chroma-Q Color Force battens of various lengths, along with Chauvet COLORado 1 Quad Zoom Tour fixture. Also included on the gear list were more than 800 conventional fixtures, mostly consisting of ETC ellipsoidals and pars. Fine spoke of the services 4Wall provided. "The service from 4Wall has always been outstanding. It's just not possible to undertake such a large and varied project without the close, expert support from the 4Wall team." Fine continued, "To say we do a few shop runs a day would be an understatement. The response-time and quick thinking at the Las Vegas shop has always been the fabulous wizards behind the curtain for us, for over a decade." Bob Gaynor, Senior Vice President of Business Development, spoke of 4Wall's involvement in yet another successful CES with Fine Design. "We were thrilled to have been able to provide Fine Design with the gear needed for CES 2017. Their entire team is great to work with, and we look forward to providing them with the latest lighting technology for future shows."